The storm ignited by Saudi Arabia’s savage assassination of the journalist Jamal Khashoggi in its Istanbul consulate has momentarily given way to a lull. The purported Saudi investigationinto the murder has put on hold any international response — even though it looks like a cover-up to shield Mohammed bin Salman, the kingdom’s crown prince and de facto ruler. Riyadh sent its attorney-general, Saud al-Mojeb, to Turkey supposedly to co-operate in the probe. Far from providing any information, Turkish officials say, the Wahhabi jurist wanted to find out how much the Turks know. A lot, is the answer; certainly enough to point the finger towards the top, as they made clear to the CIA and other western intelligence agencies. Yet anyone with even cursory knowledge of the way power works in Saudi Arabia could work that out anyway. Aside from the demand of justice for Khashoggi, the burning concern here is that, in an absolute monarchy wholly centralised around the person of the crown prince, it is truly a crisis when the wheels come off. There are real uncertainties about what happens next. The 82-year-old King Salman, although mostly removed from the day-to-day decision-making that has been delegated to Prince Mohammed, has on occasion seized hold of the policy steering wheel. In two instances this year, the king has in effect countermanded his son: shelving the crown prince’s plan to partially float the state oil company, Saudi Aramco and reaffirming Arab support for a state of Palestine with Israeli-occupied East Jerusalem as its capital. 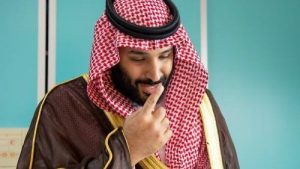 Prince Mohammed had given the US and Israel to understand Saudi Arabia had no problem with US president Donald Trump’s implied recognition of all of Jerusalem as Israel’s capital by moving the US embassy there. But, like the Khashoggi case, those issues came to the king’s attention because of their international response rather than through any internal discussion. They were mere policy, moreover, whereas this has implications for the succession to the throne and the future of the House of Saud. Prince Mohammed is likely to succeed his aged father sooner rather than later. His credentials as a would-be reformer have been shredded by a murder that, in its sheer incompetence and brazen arrogance, quite apart from its brutality, is in a class of its own. The crown prince can nevertheless ultimately count on Mr Trump’s support. While the US president is threatening the Saudis with “ severe punishment”, it seems he is tactically aligning his rhetoric with that of an enraged US Congress seemingly to dilute their maximalist positions. The Trump administration is, for example, choreographing its call for an end to Prince Mohammed’s futile war in Yemen. If the Saudi-led coalition ignores Washington, Congress will probably vote to suspend all arms sales. It looks, too, as though Washington will revive its plan to end the Saudi-led blockade of Qatar, the maverick Gulf emirate Riyadh says is behind Islamist terrorism and in league with Iran. The US persuaded Qatar to sign an anti-terror charter early this year and is now in a position to demand that Saudi Arabia does the same. Mr Trump’s continuing belief in Saudi Arabia as a cornerstone of US policy in the Middle East is a bit threadbare too. As a counterweight to Iran, the Saudis are no match militarily or ideologically. Their rogue antics have distracted from Iran’s regional adventurism and subtracted momentum from Mr Trump’s drive against the Islamic Republic. The final battery of US sanctions against Iran put in place this week seems to have softened. The White House was hitherto adamant, for instance, that there would be no waivers for countries importing large quantities of Iranian oil and gas. Now there are eight such exemptions. Tehran’s output of political bombast, meanwhile, has declined, as the Iranian political elite looks on gleefully at the mega-scandal its Saudi rivals have caused. On Israel-Palestine it was always a delusion that the crown prince could endorse a peace deal designed to Israeli specifications with a Saudi imprimatur and impose it on the Palestinians. It is an elementary error of judgment for a scion of the House of Saud — legitimised as custodians of Muslim holy places — to imagine he can surrender Jerusalem, holy to Islam as well as Judaism and Christianity, to the sole stewardship of Israel. Evidently no one in the prince’s circle was able to point this out to him — until it reached his father. What might King Salman do now? An obvious measure would be to reinstate the role of the wider royal family as a consensus-building mechanism and moderator. This would have to involve a redistribution of power to outlast the king, but it is not clear that can be done after the palace coups of last year, designed to crush Prince Mohammed’s rivals for the throne. Every bit as important is the need to revive debate about the kingdom’s future, which the crown prince has made clear he equates with dissent. After the Khashoggi affair, we have seen what the results of such dissidence are.